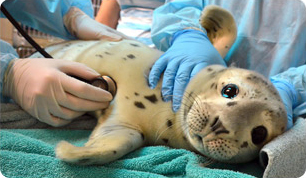 The Marine Mammal Center : 2011 - A Year of Animal Stories and News! 2011 - A Year of Animal Stories and News! What a year 2011 has been in rescuing and treating marine mammals in need! Thank you for your support! Silent Knight - Sea Lion Gunshot Wound Victim Gets a New Home! Silent Knight (left) and Henry, two blind California sea lions, hang out at The Marine Mammal Center's cetacean pool as they go through training that will prepare them for their new home at the San Francisco Zoo. No one could forget the horrific story of an adult California sea lion found on a beach in Sausalito suffering from a gunshot wound to the head in late December 2010 that left him blind. Named “Silent Knight” for his regal demeanor and the holiday season, throughout the first five months of 2011, staff and volunteers at the Center nurtured him back to a healthier body weight and treated his wounds. Unfortunately, he could not be returned to the wild due to his impediment, but instead, now has a good home at the San Francisco Zoo where he is receiving top care and is serving as an educational ambassador about the dangers marine mammals face. Milestone – Sea Lion Makes History! Since 1975, The Marine Mammal Center has rescued more than 17,000 marine mammals – an incredible achievement for sure in our history! In 2011, we marked another pivotal achievement – the rescue of our 10,000th sea lion patient in July! Thanks to you, “Milestone” not only was given such an appropriate name through a contest, but received the medical care he needed to clear up a bacterial infection (leptospirosis) that made him ill in the first place. He was released a few short weeks later back to the ocean! Wildoctric – An Elephant Seal Receives First-Known Hernia Surgery! Veterinarians at The Marine Mammal Center examine a young elephant seal patient to determine why she was not eating. Here, they learn why. She has a sliding hiatal hernia! A young, female elephant seal rescued by our volunteers in Monterey County in April presented with an unusual medical mystery – she had a hernia! Veterinarians used advanced diagnostic techniques and performed a laparoscopic gastropexy to keep the stomach from moving into the thoracic cavity. This type of surgery had not been performed on an elephant seal- a first in marine mammal medicine! Wayward Whales – Mother and Calf Gray Whales Travel Up the Klamath River! Humpback whale calf 'Dawn" does a chin slap in the Sacramento Delta. The Center was involved in a multi-agency rescue attempt and health assessment of a mother gray whale and her calf that swam up the Klamath River in June. It was a flashback to the Center’s involvement in the rescue of a humpback whale mother named "Dawn" and calf named "Delta" (pictured here) that swam up the Sacramento Delta in 2007. After nearly a month in the brackish Klamath River, the gray whale calf did eventually swim back out to sea. Unfortunately, the mother remained in the river and stranded on a sandbar where she eventually died. Old Ray - Sea lion Gets Second Chance at Life! One amazing California sea lion managed to survive, despite being attacked by two shooters. "Old Ray" was found at Moss Landing Harbor on November 15. Clearly ill, his water-drinking behavior suggested he had leptospirosis, a bacterial infection of the kidneys. Often deadly if not treated, with a round of medication and some fattening up, we hoped he’d be good as new. However, during his check up we found something disturbing. Radiographs of Old Ray’s head and torso showed that the burly 175-lb pinniped had suffered not one, but two previous gunshot attacks, identifiable because bullets and shotgun pellets were still lodged in his skull and body. We’ll never know who pulled the trigger or when Old Ray was shot, but we do know that the shooters broke federal law, which prohibits harming marine mammals. And though we don’t know how many marine mammals are killed by gunmen every year, we do know we see far too many of them. Old Ray was lucky and after treatment, he was returned back to his ocean home. Washed Ashore Exhibit – Ocean Trash Art Sculptures Take the Center and the Public by Storm! One of the most powerful tools we have to tell the story of human impact on the oceans and its inhabitants is through visuals. In 2011, we presented Washed Ashore: Plastics, Sea Life and Art by artist and educator Angela Haseltine Pozzi of Bandon, Oregon. The 14 sculptures of massive proportions she and her team created were all made from plastic trash collected on Oregon beaches. Within the beauty of the sculptures was a powerful message that resonated soundly with the estimated 30,000 people who saw the exhibit while it was on display June 25 – October 15. The message: we can make a difference in preventing ocean trash (of which 10% of our patients have been entangled in over the years) just by changing our consumer choices and recycling habits. Marine Mammal Commission – Dr. Frances Gulland is Sworn In! April 29, 2011 - Dr. Frances Gulland is sworn in as one of three U.S. Commissioners serving on the Marine Mammal Commission. In April, our Chief Scientist, Dr. Frances Gulland, was sworn in as a U.S. Marine Mammal Commissioner! This is a true honor and testament to her's and The Marine Mammal Center's pursuit of scientific inquiry into marine mammal and ocean health issues. Sarow – Sea Lion with Mysterious Gas Bubble in His Head! Our veterinarians and researchers learn so much from our patients about marine mammal health – information that would not be accessible studying these animals in the wild. In October, a young sea lion patient with the “wobbles” was admitted to the hospital for treatment. Upon medical inquiry, veterinarians learned that the cause of “Sarow’s” wobbles was related to an unusual gas bubble formation in his head – something unusual for any marine mammal since all dive underwater for long periods of time. This is the second such animal we’ve seen with this medical condition and the topic has sparked scientific inquiry into what may be causing these gas bubbles.